Captain ZERO Unveiled as an Innovative Cockroach Bait! The internet has been abuzz the past few months about a mysterious superhero character which came out on a Facebook Page by the name of Captain ZERO. Curious netizens and bloggers alike gave their share of guesses on who (or what) the dark silhouette could be. Hunches included a 'new TV show', an 'energy drink', and a 'slimming product'; the best guess was a ‘household cleaning product’. 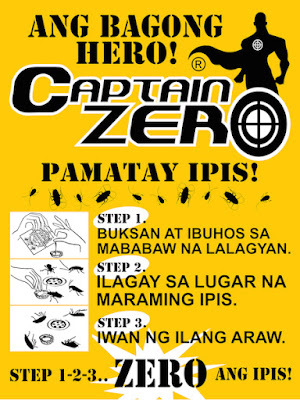 Captain ZERO Revealed Last November 17, 2016, the guessworks ended as WINZO International Corporation, the company behind Captain ZERO, unveiled the product as an innovative cockroach bait Everyone among the media guests at the launch which consists of writers and bloggers were surprised as no one among them was able to exactly guess that Captain ZERO was a cockroach bait. "A clean home means a healthy family as bacteria and germs brought about by dust and pest such as cockroaches and rats can carry diseases through contaminated food, kitchen counters, and utensils," Ms. Labii talked about the importance of cleanliness at home and shared some of her experiences as a medical professional, a food entrepreneur, and as a mother. This product is cockroach bait that can play a big role in eliminating cockroaches in areas where food is found including moist areas such as kitchen, bathrooms & garages, which these pests love. It has a unique luring action that attracts and makes these bugs feed on the paste and lets them return to their harbourages, controlling them at their source. Cockroaches who eat the bait will eventually die in a few minutes or hours depending on the size and type of the bug. The formulation is a combination of very low toxic compounds while the main active ingredient is called Trihydroxyborane. Empty one sachet in small shallow containers such as bottle caps. You can place these in moist places such as bathroom, kitchen sink, garage areas, and backyards or in places where cockroaches are frequently found. Some reports have indicated that a sachet can kill as much as 18 roaches and last for as much as 15 days (2 weeks) depending on the density of bugs in the area. 1. Open #CaptainZEROph sachet and pour into a shallow container. 2. Place container where many cockroaches are seen. 3. Leave for a few days until no more cockroaches are seen. This product is recommended to be used as a weekly regimen. Empty one sachet in separate locations (kitchen, bathrooms, garages) where there are food & heavy moisture every 1- 2 weeks to maintain a pest free environment. Although the active ingredients are low toxic to humans and animals, is still best to keep it away from children and house pets. If it is accidentally applied on the skin or eyes, simply remove it by washing the area thoroughly.